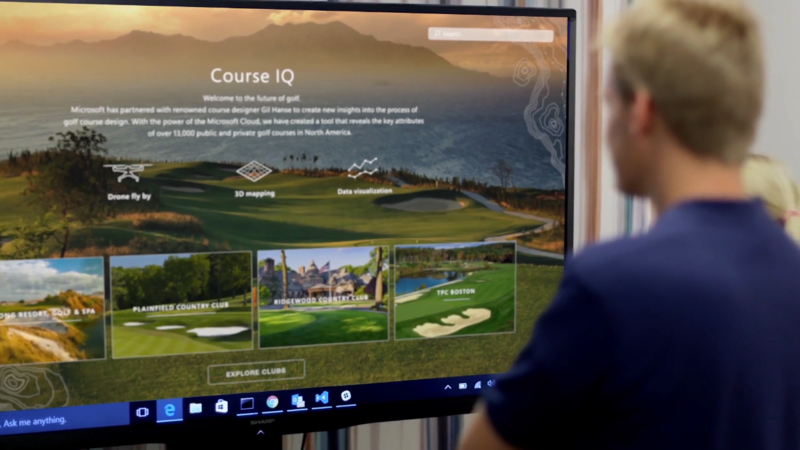 Microsoft Cloud is using data to help golf course architect Gil Hanse. See the full article here. The creation of actionable data is a process. First, it must be gathered. Then it has to be organized and understood, separating the necessary from the noise. Only then it can be effectively deployed in search of better outcomes. More and more, golf finds itself at the deployment stage. Whether using data for predictive or performance purposes, leaders are applying the fruits of data to evolve the sport, challenging long held notions of how people engage with it. What if new players, through data-rich tools and cloud-connected instruction, could learn the game in half the time? What if golfers played data-informed courses delivering a superior experience in three hours instead of five? Why can’t virtual reality allow golfers in Minnesota to play 12 months a year, or let enthusiasts design courses in the cloud for others to play? Each idea builds on the next, leveraging the power and flexibility of the cloud to give them life. Golf on the front edge of innovation. Not a bad outcome for those humble Scottish shepherds.